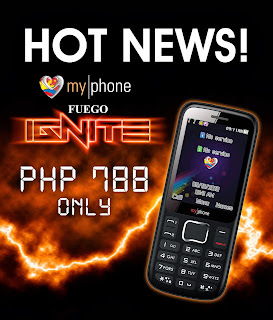 Myphone has recently launched a new dual sim bar phone - MyPhone Fuego Ignite. This bar phone has a built-in digital camera, MP3 and MP4 player, FM Radio, Bluetooth, Flashlight, expandable storage up to 8 GB via microSD card and an ultra-soft touch keys. Specs and feature-wise, I think it really beats my MyPhone B88 Duo. It is also much affordable at P788.00 only! • External Memory Expandable up to 8GB microSD.